The elderly population (age ≥65 years) has been increasing steadily in developed countries. Concurrently, morbidity, hospitalizations, costs, and mortality due to heart failure (HF) in the elderly have been increasing. One reason for these trends is that the aging process is associated with progressive cardiovascular changes that predispose to HF in older hearts. Another reason is that current HF therapies were evaluated mostly in the non-elderly. 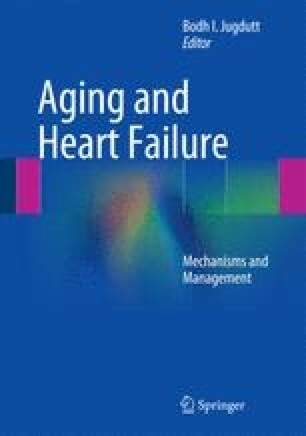 It is useful to view HF as a progressive disorder that is superimposed on an ongoing aging process in the aging and HF continuum. Two broad categories of HF—HF with preserved ejection fraction (HF/PEF) and HF with systolic dysfunction or low ejection fraction (HF/low EF)—account for most HF in the elderly and are equally prevalent, with a preponderance of HF/low EF. Trials of therapy for HF/low EF in primarily non-elderly patients showed mortality benefit in older adults and elderly patients. In contrast, most trials for HF/PEF have not shown similar mortality benefit in non-elderly or elderly patients. The aging non-elderly and elderly populations with HF are quite heterogeneous. Pharmacotherapy for HF in the elderly is challenging and needs to be individualized and consider aging subsets as well as several aging-related changes and issues. More research is needed to understand the effects of biological aging in the growing elderly HF population. More clinical trials in elderly HF patients are needed to improve their morbidity and mortality. Importantly, the trials need to systematically stratify elderly HF patients into incremental aging subsets with increasing chronological age to maximize benefits of therapy. This work was supported in part by grant # IAP99003 from the Canadian Institutes of Health Research, Ottawa, Ontario. The author is indebted to Catherine Jugdutt for expert assistance. World Health Organization (WHO). Definition of an older or elderly person. http://www.who.int/healthinfo/survey/ageingdefnolder/en/print.html. Accessed 30 Dec 2009. ClinicalTrials.gov. Prospective comparison of ARNI with ACEI to determine impact on global mortality and morbidity in patients with heart failure (PARADIGM-HF). 2012. http://clinicaltrials.gov/ct2/show/NCT01035255. Accessed 1 Aug 2012.